"It's a miserable existence being a kicker, I joke with people. It doesn't matter how many you've made, how many times you've been able to do your job, it's always about the next kick. The longer you play, the more you come to learn that. Every time I go on the field it's, 'Oh boy, here we go.'" 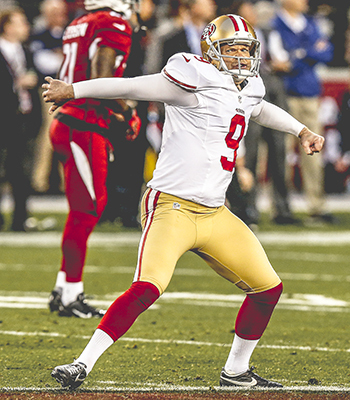 Phil Dawson never wanted to be a kicker. Where's the glamour in that? As a boy growing up in Dallas, Dawson idolized Randy White and Ed "Too Tall" Jones of the Cowboys "Doomsday Defense" and knew he wanted to be a football player. He tried his hand at different positions on both sides of the football - mainly linebacker. No, that afterthought of a position didn't cross Dawson's mind until the beginning of middle school. And even then, the idea wasn't his own. Instead, Dawson's coach needed someone to handle kick-off duties, and friends on the team volunteered Dawson for the job because they knew he once played soccer. "I knew I could kick a ball," Dawson remembered thinking at the time. And that was the seemingly chance beginning to an eventual two-decade long NFL career, the last three years of which have been with the San Francisco 49ers. "It chose me for sure," Dawson said. "But I made the decision to make sure I approached it the same way I would approach a 'real position.'" Contrary to popular belief, Dawson's offseason isn't filled with rounds of golf and time spent relaxing by the pool. In non-playoff years, Dawson's offseason workouts begin in January and start with several weeks of weight training. When the time comes to kick again, Dawson leaves his home in Austin, Texas, to a nearby field armed with nothing but a bag of footballs. The kicker puts himself through extensive situational training: kicking from the left hash, right hash, varying distances and mayday kicks when he has to run in from the sideline with an imaginary clock approaching zeroes. When the day's on-field work is complete, Dawson moves to conditioning. "I'm the one with the stopwatch, pushing myself to make sure I'm giving it my all on every sprint," Dawson said. "When I'm in the weight room, I'm lifting by myself and making sure I'm not cutting a set short." With no teammates present to keep him honest, Dawson relies on the motivation of his past failures. Dawson, who has been good on 384 career field goals, can't name his most memorable make. He can, however, recall "dang near every miss." The anguish of being off-target is far worse than the joy of seeing an attempt sail through the uprights. "To remember what it feels like to walk off the field after missing a kick, you don't ever want to experience that again," Dawson said. "So in those lonely times of training, those are the thoughts that come to mind that keep me going." Dawson hardly needs an alarm anymore. The 40-year-old has been perfecting his repertoire ever since he first became an NFL starter 17 years ago for the Cleveland Browns in 1999. Unlike some of his teammates who enjoy sleeping in, the 49ers kicker likes to be up and at 'em six hours before game time. Dawson's routine begins with a quiet moment in his hotel room, often as the sun begins to peek through the blinds. Then there's just enough time for a quick breakfast before departing for the stadium four and a half hours prior to kickoff. That's more than an hour before the first bus of his teammates leaves the team hotel. Dawson then heads to the stadium with punter Bradley Pinion and long snapper Kyle Nelson in a van carrying various football operations personnel. Prior to this season, Dawson was the lone player on that trip. Once he arrives at the venue, Dawson walks onto the vacant field and begins analyzing the weather conditions - comparing them to the hourly forecast that he's had memorized for days. With three hours until kickoff, Dawson begins to get loose. He stretches for 90 and then spends 30 minutes kicking on the field alone before his teammates join him for warmups. "That's where I gather all my information, get warmed up and make sure I'm ready to go," Dawson said. As the lone special teams captain, Dawson is also in charge of the decisions made after the coin flip. If there's an opportunity to select a side of the field, head coach Jim Tomsula gave Dawson the power to handle that choice. This is when the kicker's extensive knowledge of stadium and weather conditions is most valuable. Dawson said there have been multiple times this season when he's been able to get the wind at his back in both the third and fourth quarters by out-studying his opponent. Once the game starts, the kicker's focus sharpens. Dawson will hit a few balls into the net at the beginning of each possession to make sure he's loose. Once the ball crosses midfield, Dawson mimics the offense, paying close attention to where the ball is snapped on each play. For example, if the ball is on the right hash, Dawson will pretend that's the angle he's kicking from while he sends another ball into the net. Dawson confessed he still gets nervous each time he takes the field, but he finds solace in his routine. Regardless of how busy his day is in the box score, whether or not he gets five field-goal attempts or none, Dawson estimates he kicks around 150 balls every Sunday. Following each game, Dawson returns home and pulls out a binder with thorough notes on each of the 32 NFL stadiums. He adds any observations or new information he learned about the venue while it's fresh on his mind. "I'm probably as meticulous as they come," Dawson quipped. Dawson entered the league as an undrafted free agent in 1998 out of Texas. He was signed and subsequently waived by the Oakland Raiders before spending his rookie season on the New England Patriots practice squad. Cleveland added Dawson the following offseason - the beginning of the kicker's 14-year tenure with the Browns. That's where Dawson developed his appetite for details. Dawson credits former Browns punter Chris Gardocki for putting him on the right path towards his now scrupulous approach to his job. The two specialists were teammates for five seasons in Cleveland from 1999-2003. Now many years later, Dawson has someone of his own to tutor - Pinion, the rookie punter San Francisco selected in the fifth round of the 2015 NFL Draft. Dawson was immediately curious about the 6-foot-5 punter out of Clemson. Pinion, despite being the top-ranked punter in his draft class, wasn't the Tigers primary holder. With longtime 49ers punter Andy Lee being traded shortly following the draft, the spotlight quickly shifted onto the rookie. "The day I got here, (49ers special teams coordinator Thomas McGaughey Jr.) T-Mac gave me Phil's number and told me to get in touch with him," Pinion said. The only problem was that Pinion never thought to look up a picture of his new mentor. When Dawson arrived for minicamp, briefcase in hand, Pinion assumed he was a coach. It wasn't until after the two greeted each other when it dawned on the punter who he'd just met. "Well, I thought you were an intern," Dawson jabbed back at Pinion upon hearing the story. After a few weeks of minicamp in June, the kicker decided more work was needed prior to training camp. Pinion and Nelson flew to Austin during the month of July to spend four days working with Dawson while staying with the kicker's family. Dawson continued to critique Pinion's holding technique, ensuring that the punter would put the ball down exactly to his liking. Dawson would watch: snap to hold, snap to hold, snap to hold - over and over again until Pinion had it down. "That's when we really started to mesh," Pinion said. And just as Dawson credited Gardocki with his development more than a decade ago, Pinion said he owes much of his rookie-season success to the 49ers kicker. "I've never seen someone who's so mentally ready to play a game in my entire life," Pinion said. How does a coach go about instructing a player as experienced and technically-sound as Dawson? 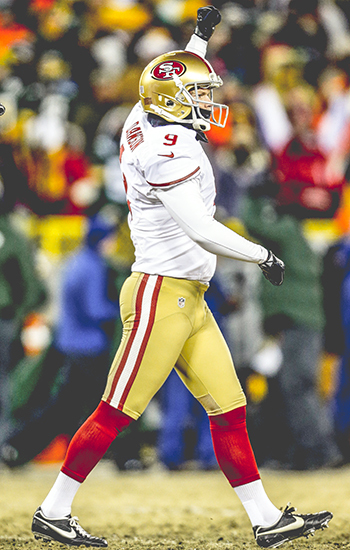 "You leave him alone," McGaughey said of the kicker who owns San Francisco's franchise record with 27 consecutive made field goals set in 2013. "You let him make the kick. He's been doing it for almost 20 years. There's not a whole lot of coaching going on with Phil. Jerry Rosburg, Dawson's special teams coordinator for six seasons in Cleveland, had a similar opinion on the subject. "This guy knows football," said Rosburg, who now holds the same position with the Baltimore Ravens. "He could coach special teams today." Rosburg came to the Browns in 2001 from Notre Dame. The coach, who also referred to Dawson as "one of the greatest men in the world," had never worked so closely with a kicker in his career. He took the opportunity to absorb what he could from Dawson. "Every day I was trying to learn from him," Rosburg said. "I told him, 'I want to help you. I want to be your other set of eyes. You need to teach me what you're trying to do, and I'll try to help you do that.' It became a partnership." Dawson is in fact the outlier, not the norm among NFL kickers. Rosburg further realized in 2003 that Dawson's value went beyond his preparation. In Week 14 of that season against the St. Louis Rams, Dawson broke his arm trying to make a tackle. Rosburg said that game is his most quintessential story about Dawson. The kicker suffered the injury in the first quarter, and after a brief trip to the locker room, Dawson returned and finished the game. In excruciating pain, Dawson connected on an extra point in the fourth quarter and kicked off twice. "That's Phil. That's who he is," said Rosburg, acknowledging that such a scenario would never happen again in today's NFL. "He wanted to finish what he started." Dawson's toughness left a lasting impression, but the injury cost the kicker the final three games of the year. Rosburg recalled that the replacements Cleveland brought in to finish the season failed to match Dawson's lofty standard. "I remember a whole different mentality," Rosburg said. Dawson's dedication to the mental side of kicking has paid dividends in his accuracy on the field. He's made 85 percent of his field goals throughout his career, 12th best in NFL history. Moreover, Dawson's percentage is the best all-time for kickers with more than 350 made field goals. Dawson enduring the winter conditions in Cleveland for 14 seasons only magnifies his accomplishments. What's more, Dawson played yearly AFC North road games in Cincinnati, Pittsburgh and Baltimore, none of which are cities known for their balmy temperatures in December. "It's nothing short of marvelous," Rosburg said of Dawson's career, which includes every notable kicking record in Browns franchise history. "This guy has worked his way into an elite kicker in National Football League history." Dawson doesn't have a timetable for when he'll hang 'em up, although he admits he's on the "back nine" of his career. There are constant reminders that the kicker is an old soul in a young man's game. Players like Eric Reid often joke with Dawson that the safety was in kindergarten when the kicker first broke into the NFL. Or when he invited Pinion to his home over the summer and the punter became fast friends with Dawson's middle-school aged boys while playing the new Star Wars video game together. "I just ask them what they're going to do when they're 40," Dawson fires back. The constant ribbing is accompanied by genuine admiration. Some of the kicker's teammates call him "The O.G." based on his tenure and success in the NFL. Not wide receiver Torrey Smith, who calls Dawson, "Uncle Phil." "I love Phil, man," Smith said. "He's a great man. As a pro and a Christian, being here a short time with him, I love being around him. The way he carries himself, both as a professional and as a father is really cool. "His presence is heavy in the locker room. Everyone looks up to him." Times have certainly changed though. It's odd for Dawson to watch the young players on the team - a qualifier which encompasses nearly the entire 53-man roster - zoom around the locker room on two-wheeled hover boards. Much to the chagrin of his prodding teammates, San Francisco's eldest statesman refuses to take part in such tomfoolery. "God made gravity for a reason," Dawson tells them. "So I'm gonna stay on the ground." Despite the evident generational gap, the free-agent-to-be isn't quite ready to call it a career just yet. Dawson said he still loves playing and is still committed to his laborious training habits. As long as he can connect from 58-yards out, the kicker knows he can be a weapon in this league. For comparison's sake, Morten Anderson, the man who owns the NFL record with 565 career made field goals, played for 25 seasons. "I'm not going to say my leg is as strong as it's ever been, because it's not," Dawson said. "But it's as strong as my team needs it to be." At the spry age of 40, Dawson is in the midst of one of his most accurate seasons. The kicker owns a streak of 19 consecutive made field goals and also provided a game-tying, 33-yard extra point against the Chicago Bears in challenging conditions at Soldier Field. And while a transition away from handling kickoff duties was a hard responsibility to let go of - Pinion handles that now for the 49ers - the reduced role has kept Dawson's body fresher this deep into the season. But it's not just his body that will tell Dawson if he can keep playing. The kicker's family, living 1,700 miles away in Austin, will also have a say in the matter. Dawson wants to make sure they're still ok with him being gone six months out of the year. "It's not ideal," Dawson said. His wife, Shannon, flies out for every home game at Levi's Stadium. Dawson's kids - sons Dru (14) and Beau (12) as well as his daughter Sophiann (nine) - attended the game over Thanksgiving weekend against the Arizona Cardinals and will attend the contests against the Cincinnati Bengals and St. Louis Rams once school is out for winter break. "It's fun for my kids to see that dad's not this old hack just walking around, he can actually do a few things here and there," Dawson said. The self-deprecated "old hack" has 381 career field goals, which ranks 11th in NFL history. With six more makes, Dawson will pass Nick Lowery (383) and former 49ers kicker David Akers (386) and assume his place in the top 10 all-time. "I glance at it from time to time," Dawson said. "I've always been one to want to know what's out there. I like chasing things. That's one of the things that keeps me going." If and when Dawson connects on his 400th career field goal, he'll be just the ninth kicker to ever reach the milestone. It's a shiny number that would put a bow on Dawson's career that's spanned over three different decades. But for a calculated man like Dawson, he knows he's already accomplished far more than the former middle-school linebacker ever imagined. "Any time that I decide to walk away," Dawson paused. "How could I have any regrets? How could I feel like I'm leaving something out there? I'm very blessed to be in that position."